Here is part of the bird I have cut out of paua abalone for the dreadnought peghead. I know....the breastpiece doesn't quite fit yet....I still have more filing to do! Above is the rose I cut from twelve separate pieces of red and green abalone. 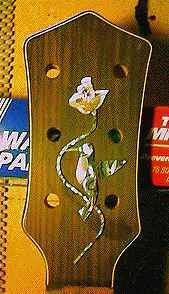 The customer lived in a section of town called the "Rosegarden" and has backyard birdhouses, so he had asked if I could somehow incorporate the two ideas into the peghead inlay. I came up with the idea of a bird kind of hovering by a rose on a stem. I'd never done inlay more elaborate than block letters, so this was indeed a challenge for me! This is the peghead shape the customer wanted. I bound it in ebony and holly. They did fit, so I went ahead, cut out the initials (7 pieces! 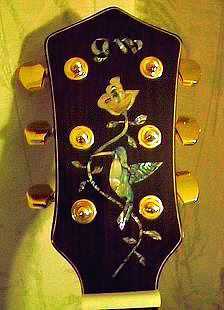 ), cut some leaves for the rose, and routed out the cavities for those. Then I epoxied them in, filled the gaps with epoxy mixed with rosewood dust, let it all harden, and finally sanded it smooth. 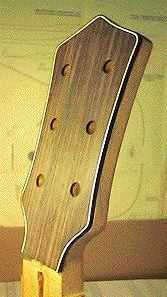 Here's the finished product, after the guitar's finish has been applied and the tuners installed. 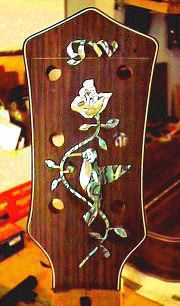 Not bad for my first fancy inlay job, huh?